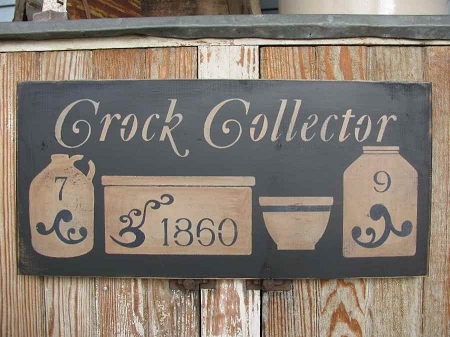 Primitive Crock Collector with Stoneware Crocks Jugs and Bowl Hand Painted Sign. This sign is beautiful and if you love and collect stoneware, then it's a must have. I have one hanging in my living room by a big cabinet housing a lot of my stoneware collection. The background of the sign is painted black. Then the crocks are all painted in khaki tan with dark blue lettering and decals. To signify salt glaze stoneware pieces of times past. I antiqued all of the stoneware pieces to show shading and depth. It's an attractive sign with a primitive look. Size is 24" x 12" x 1" thick pine wood board. Hanging options available. Hand made by Heidi.